This monastery’s picturesque setting has been the home of several notable Russian church figures. Among the numerous monasteries of the Moscow region, few have a more bucolic setting than the monastery of St. Nicholas-Peshnoshsky, located on the Yakhroma River to the northwest of the regional center of Dmitrov. 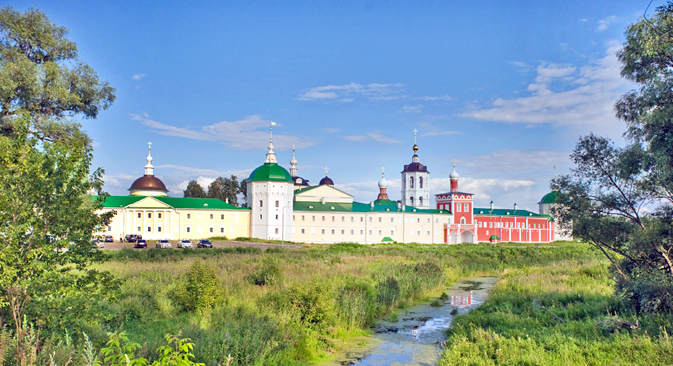 The view of the monastery, with its towers, spires and cupolas, is especially picturesque when approaching from the west along a 19th-century tree-lined causeway that crosses the small Yakhroma. The monastery was founded in 1361 by the monk Methodius, a pupil of St. Sergius of Radonezh, who laid the foundations of Muscovite monasticism. He was designated abbot of the monastery a year before his death in 1392. Canonized in the great Moscow Convocation of 1549, he became known as St. Methodius Peshnoshsky. According to legend, the name comes from his having carried heavy logs (“peshnosia”) across the stream.As usual for medieval Russian monasteries, the early buildings were made of wood. In the late 14th and 15th centuries, the monastery prospered with support from the nearby Dmitrov principality, particularly during the reigns of princes Pyotr Dmitrievich (1389-1423; son of Moscow’s Grand Prince Dmitry Donskoy) and Yury Vasilevich (1462-73; son of Grand Prince Basil II). By the turn of the 16th century the monastery had gained its first masonry structure, the Cathedral of St. Nicholas. Although modified and restored over the centuries, the core of the cathedral has remained, with four large piers supporting a single dome. The interior now has a monumental new icon screen of five rows, and the walls have been covered with frescoes painted in a medieval style. On the exterior, the original structure is partially obscured by a one-story narthex that was expanded in 1683-1691 to encompass all but the east façade, which contains the apse. In the early 19th century, the narthex was rebuilt again, this time in a decorative style. To the south of the St. Nicholas Cathedral is a tall bell tower, originally constructed in the early 16th century. The second tier of the tower contains the Church of the Epiphany, restored in the 1960s and now containing a new icon screen. The upper part of the tower was rebuilt and heightened in 1793. In the middle of the 16th century, the monastery found favor with the young Ivan IV (the Terrible; 1529-1584), who was close to Orthodox prelate Gury (Zabolotsky), abbot of the monastery in the 1530s. Tsar Ivan made annual gifts to the St. Nicholas monastery, and in 1553 he visited it during a pilgrimage to the distant St. Kirill Belozersky Monastery. To get to the monastery take the commuter train from Savelovsky railway station in Moscow or the bus #401 to Dmitrov, the bus stop is near Altufyevo subway station. Than take the bus #36. The final bus stop is called "Poselok Lugovoy". At the time of Ivan’s 1553 visit, the abbot of the monastery was Varsonofy, whose life is a revealing example of the twists of fate during the turbulent 16th century. Born around 1495 as Ivan Vasilevich to the family of a priest in Serpukhov, the youth was taken during a Crimean Tatar raid and sold into slavery in 1512. Captive for three years before his father gathered redemption money, he adapted to local conditions and learned to speak Tatar. On returning to Russia, the young Ivan took monastic vows and the name Varsonofy at Moscow’s Andronikov Monastery. In 1544, Varsonofy was appointed by Metropolitan Makary of Moscow to lead the St. Nicholas Peshnoshky Monastery. During his visit to the monastery Tsar Ivan was impressed by Varsonofy’s knowledge of the Tatar language. Ivan had conquered the Tatar capital of Kazan in 1552 and needed energetic, capable clerics to establish the Orthodox presence there. Sent to Kazan in 1555, Varsonofy participated in the creation of the Kazan Diocese and two years later founded the city’s first Orthodox monastery. His fluency in Tatar brought many converts to the faith. Ivan the Terrible’s 1553 visit to the St. Nicholas Peshnoshsky Monastery was notable for another encounter — with Vassian (Toporkov), a former bishop of Kolomna who had retired to the monastery in 1542. According to a traditional account, the tsar was counseled by Vassian to rule with a strong hand and control the power of the Muscovite boyar elite — a policy he would implement with terrifying consequences in the late 1560s. In 1584 — the year of Ivan the Terrible’s death — the still largely wooden monastery was swept by a fire. Having gradually recovered, it was ransacked in 1613 by Polish forces during the Time of Troubles, a dynastic interregnum that lasted from 1605 to 1613 and brought widespread devastation to Russia. Yet again the St. Nicholas Monastery attempted a recovery. Its brick walls were repaired, and a large west gate, completed by 1623, served as a landing at the Yakhroma River. In 1689 a church dedicated to the Transfiguration was erected over the west gate. Despite these modest gains, the rural monastery had reached a state of destitution by the latter part of the 17th century.The monastery’s financial crisis (which included the refusal of monastery peasants to fulfill their obligations) led the monks to complain to Peter the Great when he visited during a trip along the Yakhroma River to the Volga. As a result, Peter placed the depleted institution under the protection of the vastly more powerful Trinity-St. Sergius Monastery. This new position, however, deprived the St. Nicholas Monastery of self-rule and led to a further diminished status. Closed in 1764, the monastery was reopened in 1766 through the efforts of a nearby landowner, Mikhail Veryovkin, who was highly regarded in the court of Catherine the Great as a poet and translator. With its new administrative status and skilled leadership, the St. Nicholas-Peshnoshky Monastery became widely known by the turn of the 19th century as a model of proper monastic order. This transformation reached its apogee under archimandrite Makary (Briushkov), who led the monastery from 1788 to 1811 and played a major role in giving it the appearance that it has today. The reigning neoclassical style of this period is reflected in buildings such as the Church of the Purification, erected in 1812 above the walls of an early 16th century refectory. To its north is the neoclassical Church of Saint Dmitry of Rostov, built in 1811-1829 as an extension of the monastery infirmary. The final notable component is the Church of St. Sergius of Radonezh, designed in an ornamental brick style at the turn of the 20th century to replace a church built in 1732 over the grave of St. Methodius. The interior of the St. Sergius Church contains a sarcophagus with relics of St. Methodius. Like the other monastery churches, it now has a splendid new icon screen. Although flourishing at the beginning of the 20th century, the St. Nicholas monastery witnessed new turbulence in the wake of war and revolution. Closed in 1928, the monastery was given partial reprieve as a museum of local history. This interlude ended, however, in 1933, when such museums throughout the country were dispersed and their personnel either imprisoned or executed. In the late 1930s, a number of former monks were shot during mass executions of Orthodox clergy. The monastery territory was eventually given to a psychiatric hospital, which remained its function through the beginning of this century. Strenuous efforts led to the construction of new facilities for the hospital and the return of the devastated St. Nicholas-Peshnoshsky monastery to the Orthodox Church. Under the capable direction of Abbot Grigory (Klimenko), appointed in 2008, the monastery’s lavish restoration has included the creation of new icon screens and wall paintings for the church interiors. The revived monastery was formally opened at the end of August 2014 with a ceremony attended by Patriarch Kirill. Like the Russian Church generally, the St. Nicholas-Peshnoshsky Monastery has experienced in ample measure the drama of Russian history. With renewed tranquility, the monastery is now surrounded by some of the most productive agricultural land in central Russia. Fittingly, its neighbor is the Yakhroma Agrarian College at the nearby town of Novosinkovo. Today, the monastery founded by St. Methodius Peshnoshsky over 650 years ago once again shares in the bounty of the land.